The player takes an item; h is the inventory letter. 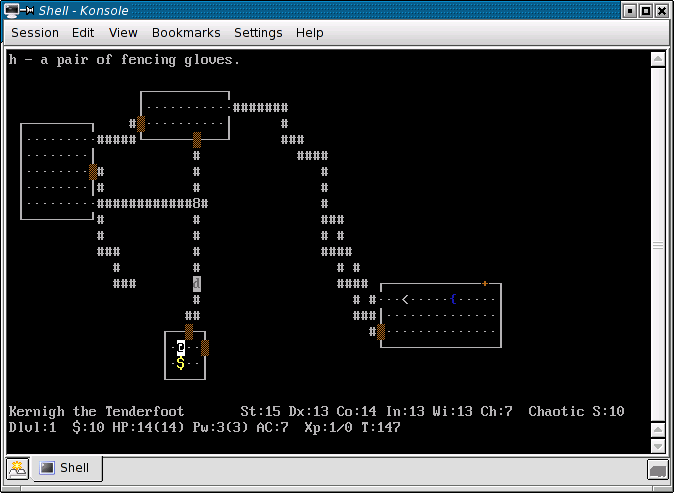 This is a screenshot of User:Kernigh playing NetHack at the nethack.alt.org public server on 22 October 2005. You can view the game with the ttyplay command by downloading the ttyrec file for 2005-10-22. The ttyrec file appears to be missing from alt.org. The NetHack game software is Copyright 1985-2003 by Stichting Mathematisch Centrum and M. Stephenson. The license is NetHack GPL. The surrounding window is Konsole, a KDE terminal emulator Copyright 1997-2004, Lars Doelle, and distributed under the GNU GPL v2. This page was last edited on 9 July 2006, at 07:46.